Goldman, like other banks, is benefiting from the ongoing improvement in the markets and the economy. While banks are adjusting to new regulation, they are finding new ways to bolster profit and cut costs, helping to drive record profit. “Adjusting to the new regulation? ?” I’ll say. 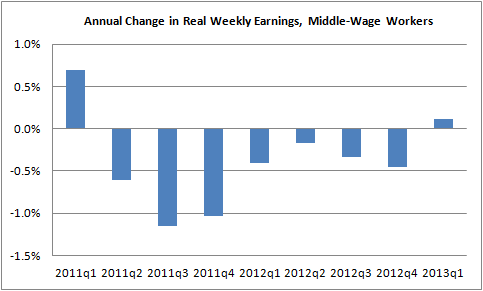 Meanwhile, here’s a picture of the annual growth rate in weekly earnings of middle-wage workers. After falling in real terms for the last seven quarters, they broke zero last quarter, up 0.1%. The dollar value of the average paycheck for these non-supervisory workers is $675/week, or about $35,000 per year, assuming full-year work. Source: BLS, earnings are for blue-collar factory workers and non-managers in services. Now I typically avoid these disembodied complaints about high profitability in a given sector. It’s both non-economic and non-contextual to just proclaim some profit number and think you’re explaining something to do with economic justice. Still, for a little context, the “record profit” part above is true and characteristic of both financial and non-financial corporations, which the compensation share of national income is at a 50 year low. Moreover, they’re related—that part above about cost-cutting? That partially refers to labor costs. And really, it’s no secret that something’s wrong with this picture and has been for a long time. The disconnect between profitability and hiring or middle-income wage growth has been embedded in our economic system for decades—this quarterly result is a mere microcosm. This reminded me of the need for a financial transaction tax. In fact, there are two tax changes I want to start working a lot harder on in terms of elevating their visibility: the FTT, and raising the salary cap on the Social Security payroll tax so it once again covers 90% of earnings. Share the post "At Least the Big Banks Are Kickin’ It…"
3 comments in reply to "At Least the Big Banks Are Kickin’ It…"
So how many weeks (days?) on average does it take to buy a “get out of jail free card” under these new ominous regulations? Folks like Mitt Romney can exert influlence on how their “earning” are paid, thus allowing the bulk, or perhaps all of their income to be exempt from SS/Medicare tax. This should be change so that the first $X of this income would be SS/Medicare tax eligible, up to the cap limit. What kind of income an individual “earns” should not impact their tax liability. It’s just a loophole designed by the rich and powerful, for the rich and powerful. It’s nice to have sweeeeet, sweeeeet cash while others are broke. You can buy assets for a song. And the big banks received very, very large government bailouts, and can do business with others knowing that these banks will received future bailouts as needed, which has got to be good for their credit rating.